So Christmas time has come and gone, and all the new arrivals sit in their correct spots collecting dust, because why? Well, because of the box. 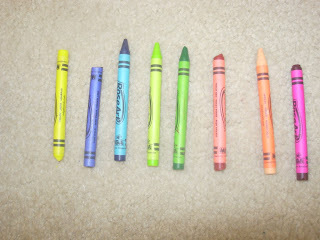 It all started with a small set of crayons. Three crayons for each little box color er. 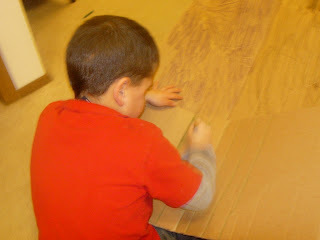 Conner was definitely the instigator of this art project. He is my artist, my little Mr. detail. He is very good at what he does too, if any of you have seen a drawing of an airplane or tractor by the artist, you would agree. I hope he is the next Vincent Van Gogh. Taylor soon jumped in on the fun, and she is my ms. colorful, making sure all the crayons are used and the colors are uniquely spread throughout. Maybe she'll be into fashion? 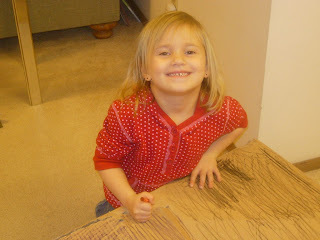 Presley, my little ms. destruct-o lately, tried to color, but she was more interested in destroying the box. 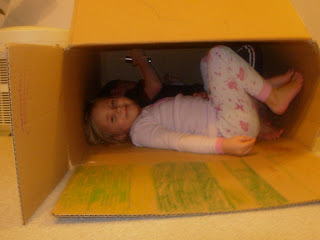 They finally convinced her to play inside the box and that is where she remained, for a very long time. Her fate is yet to be decided. Maybe she'll help people stay put with things, finances, counseling, who knows. Help people realize where they are at in life is just o.k. ? We'll see. 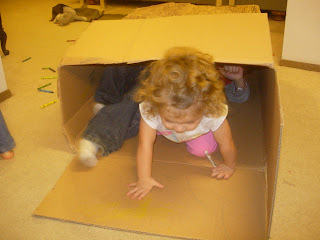 After the box was covered in unique scenery, a flashlight was retrieved and the fun began inside the box, imagine that. I'm glad we had a big box to fit everyone in, taking turns would have been out of the question. So here are my little one's box. Yep a box. Equipped with air holes so they could breathe while inside the box, of course a definite necessity. Let me clarify; this is NOT a new Christmas present, or something i payed for, it's a box. Our new found friend was created about a week ago, and per request of the tantrums that were thrown when I moved the box, here it resides, in my living room, a week later going on strong, a box. I think next year I will purchase three brand new boxes, wrap them each with a set of crayons, and stuff them under the tree. That is so fun, we had a BOX in my office for about a month that was the hot item. It died (tore) and made it's way to the trash. Easy fun. We need another box. What a great idea! Just buy boxes and wrap them up! 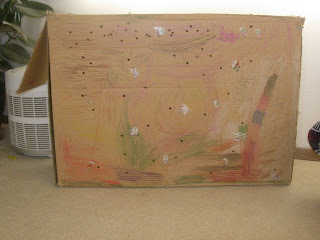 When we moved into our house, it took a GREAT amount of effort to finally junk the boxes. Our boys just wanted to play and play and PLAY! Good comment on the Milligan blog, by the way! funny how the little things are what the kids enjoy most huh? cute!